...that Jason Morelli is obsessed with the jazz music of 1941? For the UNSC's conflict with the Didact, see Post-Covenant War conflicts. "Ten thousand years ago, humans had fought a war against Forerunners — and lost. The centers of human civilization had been dismantled and the humans themselves devolved and shattered into many forms, some said as punishment — but more likely because they were a naturally violent species." The human-Forerunner wars, also referred to collectively as the Human-Forerunner War, were a series of major interstellar conflicts fought between the human-San'Shyuum alliance and the Forerunner ecumene for over a millennium from around 107,445 BCE to 106,445 BCE across the Orion Arm of the Milky Way galaxy. Stemming from a Flood outbreak in the humans' dominion, the wars resulted in the dismantling of humanity's interstellar empire and in the quarantine of the San'Shyuum species. The Librarian considered the wars to have been the greatest threat to Forerunner power in their history and believed the conflict weakened the Forerunners enough to allow the Flood to emerge victorious until the firing of the Halos. While humanity's defeat affirmed Forerunner dominance over the entire galaxy, the destruction of a major military power combined with the subsequent political schism within the highest levels of Forerunner society set the stage for the return of the Flood and the disastrous Forerunner-Flood war. Humanity held less power in the galaxy than the Forerunners, and held the Forerunners' interference in the affairs of other species with contempt. Looking to escape from the Forerunners' dominion, humanity expanded throughout the Orion Arm and eventually built an impressive empire consisting of at least 20,000 worlds in a thousand systems. The Didact had considered humanity to be the second greatest military power in the galaxy and the latest rival to Forerunner influence before the Flood. In their early history, humanity had allied themselves with the more technologically sophisticated San'Shyuum; this alliance produced technology that easily rivaled that of the Forerunners. As they collected and studied Precursor technology at Charum Hakkor, creating one of the largest collections of Precursor artifacts in the galaxy, humanity's rapid technological achievements made them increasingly arrogant and willing to challenge Forerunner dominance. This, coupled with their belief that they were the true inheritors of the Mantle from the Precursors rather than the Forerunners (which, ironically, turned out to be true), made them ideological enemies with the Forerunners. The Didact, commander-in-chief of the Forerunner military, saw humanity as one of the most contentious, bigoted, and self-centered species in the galaxy. During their colonization of other planets, humans discovered automated cargo ships of unknown origin, which had supposedly arrived from the Large Magellanic Cloud, crashed on planets near the edge of the galaxy. The humans found no crew, with the ships appearing to be automated, but they did find millions of small transparent cylinders filled with an unknown powder. Initial testing was done in the strictest containment. These early tests showed the powder to be harmless and useless, being composed of lifeless short-chain organic molecules. Early experiments demonstrated psychotropic effects on some smaller domesticated animals, one of which being the Pheru. The powder tests on the Pheru proved to be initially harmless, and indeed appeared to encourage desirable traits to appear in their appearance and behavior. However, over time the powder began merging with and altering the genome of the Pheru in order to generate its own Flood Super Cells. Soon, the infected Pheru began to infect others and even began showing some symptoms of the Flood mutation, such as fleshy tentacle-like rods. Close contact with the Pheru spread the infection to humanity. Some San'Shyuum were also infected as the Pheru were also kept as pets on the San'Shyuum worlds. Eventually the Flood began to spread, and the Feral Stage was initiated. A human ship prepares to cleanse an infested planet by orbital bombardment. "Humanity hadn't been expanding. They were running." By the time the human officials discovered what the powder had done, it was too late. Entire planets were infected, and the Flood began to aggressively expand. Humans, in desperation, began forcefully taking worlds from other species to make up for the ones they had lost. Humanity annihilated fifty defenseless systems in which the Forerunners had resettled other species. After the indigenous populations were eliminated, humanity replaced them with their own colonies to strengthen their hold over their new territories. Humanity looked to forcibly take new worlds anywhere, including those inhabited by Forerunners. However, not all of this seemingly irrational violence was driven by the will to expand; instead, human fleets under the command of Forthencho, Lord of Admirals were sterilizing planets with Flood infestations. When Forerunner worlds became infected, they were immediately targeted for orbital bombardment, killing millions of Forerunners in the process. As the Forerunners apparently did not believe the Flood a credible threat to their ecumene, these actions only fueled their hatred towards perceived human aggression against other species. Erda, humanity's homeworld, was one of the earliest worlds lost to the Forerunners, a tremendous blow to humanity's morale. Over the course of the millennium-long conflict, humanity never came closer than 15,000 light years of the Orion complex, the center of Forerunner power. The Didact came up with a "star-hopping" plan, wherein Forerunner fleets would jump to strategically important human worlds and simply skip other less important human star systems, allowing the Forerunners to conserve their resources and fight efficiently. Forty years before humanity's last conflict with the Forerunners, an ancient being known as the Primordial was discovered by a human science expedition. Human researchers brought the creature to Charum Hakkor and attempted to ask the creature about the Flood. They received answers so traumatizing many of them committed suicide rather than live with the knowledge. As a last desperate measure, humanity's leaders decided to take a third of their population and genetically altered them. They then took this third of the human population and allowed the Flood to consume them. The new genes, it was believed, aggressively killed off Flood biomatter and destroyed the Flood until the few that survived were forced to escape. They would not reappear for another 9,000 years. In truth, however, the Flood had not been defeated, and the genetic alterations had not been effective at combating the parasite. Rather, the Flood willingly retreated, though the reasons why they did so would not become apparent until thousands of years later. A human warrior falls in battle. The conflict with the Flood destroyed countless human-populated systems and cost more than a third of humanity's population and significant military resources. Despite the disadvantage of fighting a massive two-front war, humanity managed to prevail over the Flood and still nearly prevailed over the Forerunners as well. However, the Flood had taken their toll and, in their defeat, sounded the death knell of early human civilization at the hands of the Didact. While human forces were capable of dealing with the Forerunners on equal footing, the total forces they could commit were never enough to ensure victory. After the Flood began to recede from the galaxy, humans could allocate more of their military strength against the Forerunners, but the Didact's Warriors had already gained the strategic upper hand while humanity battled the parasite. While dying out, the Flood still maintained control over thousands of worlds across the galactic margin. The Forerunner Warrior-Servants under the Didact's leadership came into contact with the parasite at this time, resulting in the infection of hundreds of their battle fleets. However, once they understood the threat of the Flood posed, they adopted a policy of total extermination and were able to defeat the parasite via sheer firepower. From the few scattered specimens retained for analysis, the Forerunners first learned of the Flood's logic plague, which had corrupted the onboard ancillas on the infested fleets. Human ships destroyed above Charum Hakkor. Preceding the final conflict in the wars, humanity made great advances in military and science technology on par with those of the Forerunners, thanks to the efforts of humanity's Political and Morale Commander Yprin Yprikushma, who encouraged humans to study Forerunner technologies from humanity's earlier conflicts with Forerunners. At the same time, the Forerunner Builder rate engineered numerous new weapons and vessels for the war effort, increasing their wealth and power by a tremendous degree. The human military was eventually pushed back to their capital at Charum Hakkor and a few other core systems by the Didact's Warrior-Servants. Human forces continually lost star system after system. Eventually, Charum Hakkor was cut off from the rest of the empire by the Didact's naval fleets. On Charum Hakkor, humanity incorporated Precursor technology into their own designs, constructing formidable fortifications capable of standing up to even the strongest fleets. Among them were unbending filaments that linked their orbital platforms' defenses. Despite having the combined Forerunner military at his disposal, it took great effort from the Didact to defeat the human resistance and capture the capital. Among the Forerunner casualties were all the Didact's children. Although cut off and unable to receive reinforcements from the San'Shyuum, the humans held off continuous attacks for fifty-three years. The San 'Shyuum leadership surrendered to the Forerunners at some point during this time, leaving their human allies and the remaining San'Shyuum on Charum Hakkor stranded. When the planet finally fell, a significant number of humans and San 'Shyuum committed suicide rather than being taken prisoner. The defeat was disastrous for both humanity and the San'Shyuum. The victorious Forerunners decided to dismantle human civilization, causing the species to regress to a pre-technological state. Remnants of the human species were gathered from across the galaxy by the Forerunners and their subject species, to be exiled to their homeworld and forced through a process of biological devolution. Due to the Flood's sudden retreat in the final stages of the war, the Forerunner leadership had come to believe that humanity had found a cure for the parasite. This achievement spared humanity from extinction, a fate that had fallen on many species that challenged Forerunner control over the ages. Although herself skeptical of the existence of a cure, the Librarian appealed to the Ecumene Council so that humanity would be spared, as only with humanity's culture and civilization-wide exchange intact the Forerunners could hope to unlock the cure to the Flood. The Council agreed, but only in part: as opposed to maintaining the humans in their organic forms, numerous humans on Charum Hakkor had their minds extracted via Composers and subsequently cycled through a rote of interrogation for thousands of years. Copies of these memories were also implanted by the Librarian in the genetic material of future human generations, designed to awaken when the right circumstances were met as part of her own plans. However, the Librarian and her Lifeworkers remained highly skeptical of whether a cure really existed. Their projections showed that the Flood should have been able to completely overrun the galaxy in several centuries, and suspected that there was something else at play with regard to the Flood's retreat. It was later discovered that not only had humanity not found a cure for the Flood, but that the Flood's retreat had been a feint, undertaken both for the purpose of preserving humanity from destruction at the Forerunners' hands, and for the purpose of wasting Forerunner time and resources on a dead-end hunt for a Flood cure that had never existed. The threat of the Flood would lead to the rise of the corrupt Builders led by Master Builder Faber and eventually the banishment and execution of the Promethean leadership and the marginalization of the Warrior-Servant rate. Once humanity was defeated, the tragedies of the war convinced the Didact and his fellow Prometheans that using the Halo Array, like the destruction of humanity, would violate the Mantle. The Prometheans opposed and successfully forestalled the construction of the Halos for thousands of years, until their defeat by the Builders. While opposed to the complete destruction of humanity advocated by the Council, the Didact blamed humanity for taking the Mantle of Responsibility upon themselves, believing it was their reckless actions that brought the sickness into the galaxy. In truth, the Forerunners had even less success in battling the Flood than their human rivals. The Mantle, holding that all life was sacred, hamstrung Forerunner attempts to combat the infection, allowing the parasite to exponentially expand until no force could stop it. The Didact later regretted the devolution of humanity, as he had been unaware that the Flood was the reason for humanity's earlier aggression. The San'Shyuum home system was placed under quarantine, with the Forerunner Fortress-class vessel Deep Reverence orbiting the species' homeworld, Janjur Qom. Access from outside of the system was blocked by a quarantine shield. When the Librarian attempted to index the San'Shyuum during the early stages of Forerunner-Flood war, the San'Shyuum mistook her intentions and rose in revolt against the Forerunners. Master Builder Faber took this opportunity to test Halo's effects on living beings, by testing the weapon on the San'Shyuum homeworld. The test surpassed all expectations. This genocidal act led to the near extinction of the San'Shyuum, as well as Faber's removal from power and his subsequent trial on charges of treason against the Mantle. In the year 2557, during the Battle of Requiem, the Didact was reawakened on the Forerunner shield world of Requiem where he intended to finish the destruction of humanity. While on Requiem, a present-day human, SPARTAN-II John-117 encountered a personality imprint of the Librarian who showed John visions of the war and explained the events. The Librarian called the prehistoric human civilization the greatest enemy the Forerunners had ever faced and explained how they had been running from the Flood. The Librarian warned John that the Didact intended to destroy humanity to end his ancient enemy once and for all. To protect John, the Librarian activated an immunity to the Composer she had placed in the geas of humanity when she indexed the species. The Didact subsequently retrieved the Composer from Ivanoff Station and attempted to compose the human homeworld of Earth. 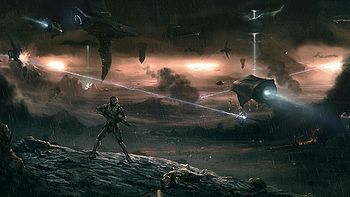 In the subsequent conflict, John managed to destroy both the Composer and the Didact's flagship Mantle's Approach, foiling his revenge plot, but not before seven million people were composed by the Didact.